Dale Earnhardt Jr. as The Dark Knight? Nah, he's too nice of a guy. But that won't stop him from driving his No. 88 Chevrolet in a special paint scheme this weekend, inspired by The Dark Knight Rises, the third and final installment of Christopher Nolan’s Batman trilogy (in theaters July 20). NASCAR is the king of sports marketing, and Dale Jr. is its prince, continuing to be one of the most sponsored and endorsed drivers, just as he has been for more than a decade in NASCAR's top series. 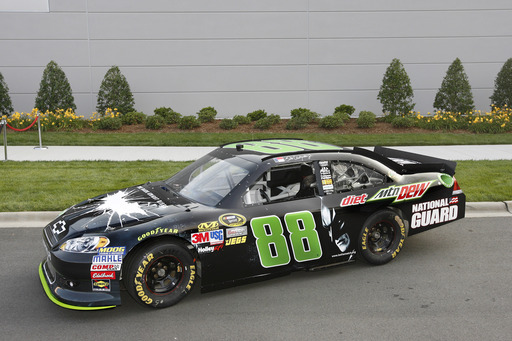 One of Dale Jr.'s top sponsors is Diet Mountain Dew (www.dewcrew.com), which shares naming rights on his car with the U.S. National Guard. Mountain Dew has a large partnership with The Dark Knight Rises--beginning Monday you'll be able to purchase Mountain Dew Dark Berry, a limited-time-only flavor, as well as special 16-ounce cans of Mountain Dew that feature the bat symbol (dewgothamcity.com). The day before, this Sunday, Dale Jr. will drive The Dark Knight Rises-themed car at the Quicken Loans 400 at Michigan International Speedway (noon on TNT). He actually unveiled the car two and a half weeks ago at the Hendrick Motorsports Fan Fest, which took place during Charlotte's race weeks. The blacked-out racecar features the Bat Shield on the hood, and Batman and Bane, Gotham City’s newest villain, on either side. In this video below, you can watch how the car was wrapped at Hendrick. Points-wise, Dale Jr. is having a great season, currently in second place in the NASCAR Sprint Cup Series standings, thanks to five top-five finishes and 11 top-10s this season. At this rate, he's a shoe-in to make the Chase this fall, but he continues to drive under a dark cloud, having not won a race in four years. In fact, the last time he took home the checkered flag in a Sprint Cup race was June 15, 2008 at Michigan International Speedway, the same track he's competing at this weekend. Sunday is not only race day, it's also Father's Day, and since he'll forever be known as his father's son, this would be the perfect time for him to end his 143-race winless streak. The late, great Dale Sr., of course, was known as The Intimidator and drove his black No. 3 Chevrolet for several years. With Dale Jr. driving a black Chevy on Father's Day, perhaps he can channel the spirit of his dad's winning ways--and The Dark Knight Rises to victory.